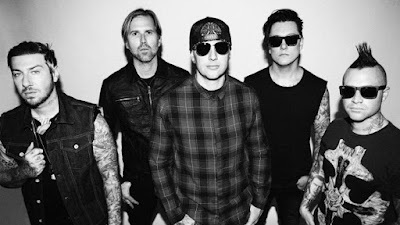 M.Shadows recently talked to Revolver Magazine. You can read some excerpts below. "I don't want to put on the same tour that everybody else is going to be putting on this summer," he explains. "We want people to know that we're trying to really branch out, and really bring something eclectic, and maybe open their mind to some other kind of music that they didn't know they liked." THE END OF THE WORLD TOUR SEEMS LIKE A PRETTY FUN WAY FOR YOU GUYS TO SPEND A SUMMER. 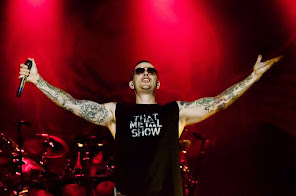 M. SHADOWS Oh, yeah! We did some press a couple days ago, and I met Tom Morello and B-Real for the first time, and man, they're such great guys! I really didn't know what to expect, but they were super personable and super talkative. Them being the legends that they are — and I grew up listening to all that stuff — they don't have to be as cool as they're being, and they're being very cool. So that makes me excited about hanging out with them. WERE YOU A LITTLE BIT INTIMIDATED ABOUT MEETING THEM FOR THE FIRST TIME? I wouldn't say intimidated — I just don't know enough about them. We've met bands that are older than us and, you know, they just hate us; they don't want a new band coming around, they don't want to deal with it. [Laughs] And I didn't get that vibe at all from them. I got the vibe that they know who we are, they know what we bring to the table, and they know we know who they are and what they bring to the table. We're both just super excited about putting on a huge, festival-like environment with our two bands, Three Days Grace and Ho9909. And it makes me excited that they're excited. MORELLO'S DEFINITELY A DOWN-TO-EARTH DUDE — AND HE'S A TOTAL MUSIC HEAD, SO I CAN SEE HIM GETTING ALONG WELL WITH YOU GUYS. Honestly, the musicianship stuff is what stuck out to me the most. He kept talking over and over about how both bands play their instruments well, and that's what he wants to bring to the masses this summer — that it doesn't have to be dumbed-down or cookie-cutter, whether it's pop or rock or hip-hop or whatever. Growing up, Tom Morello was one of our favorite guitar players, just because it was so insane what he was playing in Rage Against the Machine, like, "Who picks up a guitar and makes those kinds of noises with it?" The creativity in that guy is unbelievable. DO YOU ENVISION HIM COMING OUT TO DO A SONG OR TWO WITH YOU GUYS? After meeting him, I'd be surprised if something like that didn't happen. He's just so easy to talk to and hang out with. I mean, that'd be pretty rad! WHAT ABOUT THE OTHER BANDS ON THE TOUR, THREE DAYS GRACE AND HO9909 — WHAT MADE YOU DECIDE TO BRING THEM ALONG? Well, we took Ho9909 out on a mini-tour we did with A Day to Remember recently, and the confused look on our fans' faces was so priceless, we decided we had to bring them out again. [Laughs] These guys are out there going crazy and screaming in peoples' faces, and it's very abrasive, but I love that! Three Days Grace, that's a band that we went out with on Uproar a few years back, and they were just such sweet guys. We saw them on this last tour we did with Breaking Benjamin. The drummer came out to the show, and we just hung out and drank some whiskey with him. And we were like, "Yeah, let's bring those guys out!" LOOKING BACK, CAN YOU THINK OF ANY SHOW YOU SAW WHEN YOU WERE YOUNGER THAT REALLY BLEW YOUR MIND WITH ITS DIVERSITY? One that sticks out to me was when Metallica went out in 1994 with Candlebox opening, and then Suicidal Tendencies and Fight were on the bill, as well. This was like one of my first shows, and I went with the Rev, and I remember Candlebox getting shoes thrown at them the whole time. [Laughs] I know these kinds of bills don't always work, but I don't want our fans to think that every time they see Avenged Sevenfold, they're going to see the same bands that they hear on the same radio stations doing the same stuff. We don't want to fit in that mold, and we want to keep bringing out things that are going to make people think a little bit. YOU'RE ALSO PLAYING A NUMBER OF EUROPEAN FESTIVAL DATES THIS SUMMER. ARE THERE ANY THAT YOU'RE PARTICULARLY LOOKING FORWARD TO? I think Download is a really special one; any time you get to headline that, it's a total honor. And I'm also excited to be asked to headline Hellfest this year. The last time we were there [in 2014], we played after Aerosmith, but we weren't headlining over them — we were like the one o'clock in the morning band. And everyone seemed to stay, and it was unbelievable! There's a couple of other ones; we'll get to play with Guns N' Roses a couple times, and we'll get to play with Ozzy a couple times, which will be awesome. I SEE THAT YOU'RE ALSO PLAYING TEL AVIV THIS SUMMER. IS THIS YOUR FIRST-EVER GIG IN ISRAEL? Yeah, first Israel gig! You know, I really don't know enough about the politics of all that, so I was surprised by both the backlash and the excitement around it. I've been getting emails from friends who are from there who are like, "This is gonna be the best!" And then there are all these other people online who are like, "We're so disappointed in you!" It's like, oh my god — we just want to play music! One thing we do know, though, is that there's this group of Israeli fans that follow us all over Europe; we would go to like, Berlin, and there'd be like 250 of these kids, and then we'd see them again in Amsterdam. So we're like, "OK, we've gotta go to these people." So we're doing it, and it's pretty darn exciting.